Meet Noel, the cutest little Morkie from Tokyo. The Japanese always have the cutest style and their doggies are no different. How adorable is Noel’s sweet yellow top? As a fashionista, I am jealous at how cute she is. At first, I didn’t know what kind of dog Noel is. She almost looked like a baby schnauzer, due to her coloring, but I realized her snout was too short. And then after doing some online research, I found out she is a Morkie. Morkies are a “designer dog,” which means they are a cross of two purebred dogs. 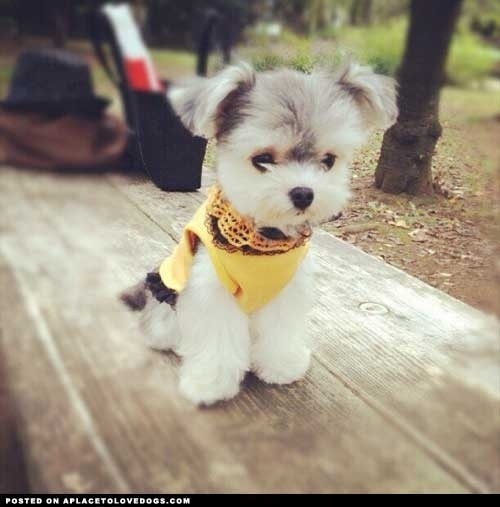 Morkies are a beautiful mix of Yorkie and Maltese. They are so cute! I’m looking for a small puppy mixed.